I’m currently focusing most of my energy toward dance as a company member of 11: Dance Co. Our show “Miranda: The Inevitable Disintegration of All Things” premieres on September 18, 2018. As for writing, revisions on my current work-in-progress, Shift, are underway as part of my Camp NaNoWriMo project. I’m looking forward to participating in the University of Iowa’s International Writing Program starting mid-July. My book recommendations for urban fantasy as well as young adult / new adult enthusiasts are The Raven Cycle series, All the Crooked Saints by Maggie Stiefvater, along with The Night Circus by Erin Morgenstern. All the magical things! Readers can find me on my website HintofJam.com and through the handle @JASabangan on social media, especially Instagram, Twitter, and Facebook. Right now I’m just back in the Chicago suburbs for the summer working in a kitchen at a steakhouse. I’m reading Cat’s Cradle (Kurt Vonnegut), How Music Works (David Byrne), and watching lots and lots of Netflix. I guess the only media recommendation, TV wise, I’d have then is James Acaster’s Netflix stand up special “Repertoire.” Super funny (if you can understand his accent). I also drove my car here from Portland which let me listen to NPR’s “Invisibilia” podcast, which I really liked. I guess the only “project” I’m working on is trying to book bands to come to University of Portland next year to play. Actually, lemme know if anyone at Microcosm knows a band/musician who might be into that! You can reach me at my instagram, @s_leicht. I am currently living in Melbourne, Australia and working, working, working by day, and making art by night. A couple of months ago I started a personal project where I began writing at least one poem a day. Poetry is everything to me, and after I finished writing my Honours thesis, I just stopped writing. Now I am making the time to make art, and I feel so much better for it. This process is really helping me to continue to work out how and why I write, and what I enjoy writing about. Learning to listen to my own voice and express it can be really cathartic, but also creatively challenging. 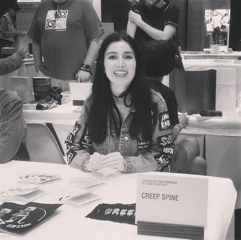 I am also still making my zine, CREEPSPINE, on the side, and I have been planning a couple arty projects and starting to play with clay as well. I finally read Just Kids by Patti Smith and every time I talk about it I get very emotional. Her writing and stories are such a pleasure to read. Also, I just started The Notebooks of Malte Laurids Brigge by Rainer Maria Rilke and so far I love it. If you like poetry, then this is the kind of prose you’d like to read. Rilke’s style of writing is so detailed and subtly evocative, it catches me off guard and I just have to pause to take it all in. 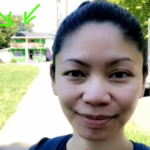 I’ve been attending Mills College in Oakland, CA. 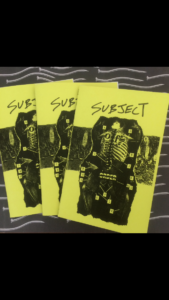 Last month I put out a second installment of THOUGHT ROT zine, titled “Subject of Order”. More recently, I’ve started writing for Audiofemme, an online music journal written by women. Find me at rot_thought on Instagram. I’m back home in Los Angeles, working as a writer for the online publication “Attack of the Fanboy”, where I write video game-related news articles, opinion pieces, reviews and guides. Recently, I got back from covering this year’s E3. I finished writing my novel a little while ago and am trying to get it published. Earlier this year, I wrapped on a short film that is currently in post-production, which I helped write and acted in, as well as acting as Executive Producer. I also released my first narrative-driven video game earlier this year and am currently working on another one. I released my sixth and only good studio album, which is available on iTunes, Google Play, Amazon and Spotify (and YouTube: Resident Useless – The End of Days (2018)). I haven’t had much time to read books, that being said, I can recommend some great story-driven games! Some of my personal favorites are: Naughty Dog’s The Last of Us, Telltale’s The Walking Dead (the first season, not A New Frontier), Toby Fox’s Undertale, PlatinumGames’ NieR: Automata, DONTNOD’s Life is Strange and Team Salvato’s Doki Doki Literature Club! Want to check out our radical punk zinester scene for yourself? Learn more about volunteering. Note: This post was compiled & edited by intern Hanna Baublitz. Also, each section was written over the summer, so some folks may already be on to new projects by now! Follow them yourself and find out!